Dr. Sheila Robinson is the poster woman for turning adversity into opportunity. As an African American born in the South, she faced barriers based on her looks and background that she didn’t think possible. She focused on solutions, not problems; she looked for ways to make things better and urged others to be the best they could be. Her journey through her life experiences, which sometimes hurt to the core, hardened her resolve to be a courageous advocate for women helping women and lifting up everyone from all races, cultures and backgrounds. Sheila founded Diversity Woman Magazine for women seeking career advancement and a national conference that ranks among the most beneficial in the country. Among her many awards is being named one of the 50 Top Women in Magazine Publishing for her significant contributions. 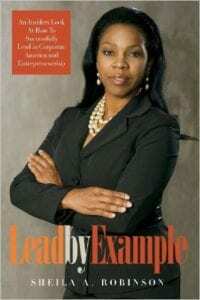 Her book, Lead by Example: An Insiders Look at How to Successfully Lead in Corporate America and Entrepreneurship, provides practical guidance for women to succeed in corporate America and entrepreneurship, based on her own valuable experience. 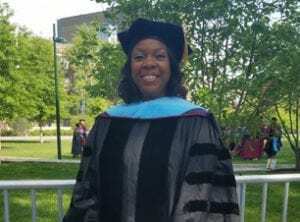 And most recently, Sheila became Dr. Sheila Robinson when she was awarded her Chief Learning Officer (CLO) Doctorate of Education at University of Pennsylvania. When Sheila wrote her book, she did it to share her journey, not understanding immediately that she had been developing leadership skills along the way. A question was presented to her once, “Are you born a leader or do you learn to be a leader?” She decided that it’s a bit of both. And in answering the question, she realized that we are all leaders, from administrators to CEOs. Her administrative assistant is the most phenomenal leader she knows and Sheila credits much of her success to her assistant. Mothers are leaders who guide their children through behavior on the playground and at school. Many women have a tendency to try to hold other women back when they try to be successful. Both Dr. Nancy and Sheila discuss how they confronted this behavior during their journeys. Sheila wonders if women have been so beaten down by society that we see ourselves as servants and can’t imagine being leaders. Her mission is to dispel the myths and help women see their best selves and their best potential for achieving their dreams. Sheila credits her success, not to people who look like her, but instead acknowledges that her achievements come from the women and men from all races, cultures and backgrounds. That’s why she works so hard to educate and include everyone in the potential to be their best. Check out www.diversitywoman.com for more information about Sheila, her book, magazine and the 2016 The National Diversity National Women’s Leadership Council in Baltimore, Maryland, in October. Listen to this interview to hear Sheila tell her own amazing story and Dr. Nancy’s and Sheila’s discussion about how women helping women and everyone working together can make anything possible.